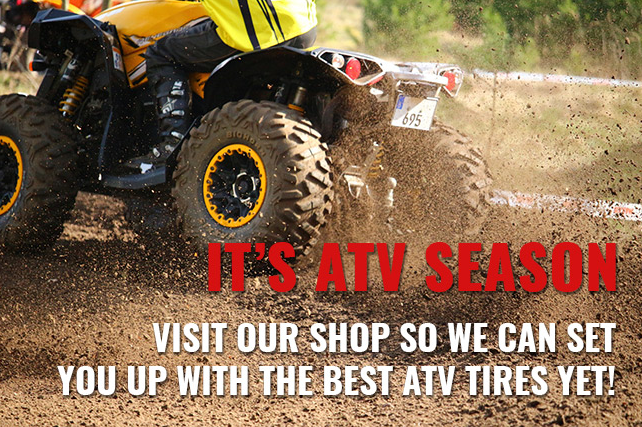 We'll get you on the road and ready for great times with our line of ATV tires. We've got what you need for vacations, weekend getaways, road trips, and more. Hogan Tire is the number one choice for all-terrain vehicle tires (ATV). ATV tires are made for ATVs and four-wheeled motorcycles (often called "quads"). ATV tires are large, wide-profile tires intended to perform well in a variety of commonly encountered off-road environments & conditions. There are ATV tires for every type of terrain as well as general-purpose ATV tires. ATV tires that are designed for specific conditions, such as sand or mud, will perform better than general-purpose tires. Before investing in a good set of ATV tires, discuss your riding style with one of our trained staff to get the best fit for your riding purposes. Tires designed for the terrain in which you'll be riding will not only be safer and perform better, but will also actually last longer. If you have questions, or need more information, please contact us.